If you harbored any doubts about Toronto’s seriousness about being a major center of technology and innovation, they’d probably be quickly put to rest with a look at MaRS Discovery District. 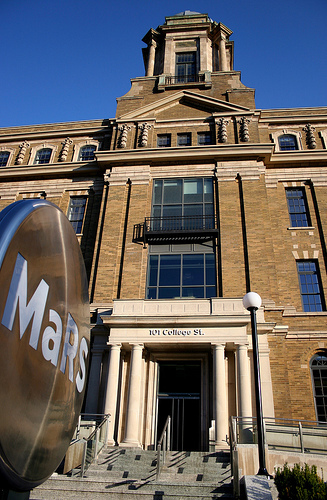 Housed in a massive historical building — a former hospital that was the site of the first administration of penicillin — MaRS opened the doors to its 700,000 square foot centre in 2005 to be a non-profit center for all things tech, science, and medicine. It’s an impressive sight from both the outside and inside; there’s definitely a buzz about the place. Today, its occupancy has been so high that the program is actually building a second equally large building right next door to fulfill the demand for entrepreneurs and companies who want to house their operations there. So while we were in Toronto last week for the first leg of our TechCrunch Northern Meetups, we made it a point to stop by MaRS and take a look around. In the video embedded above, you can see our interview with MaRS CEO Ilse Treurnicht and hear her talk about the building’s history, the environment she is working to create at MaRS, how MaRS covers its costs as a non-profit, how Toronto plays into the global tech scene, and more.